Oakland mayor Libby Schaaf speaks with Emily Webb, Sutter Health’s Bay Area Director of Community Health Programs and Dr. Jerry Kozai. Sutter Health has financially supported three separate Community Cabin sites in Oakland in the last year. 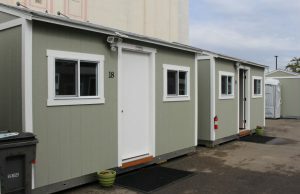 Each location was chosen in response to persistent public health and safety hazards at an existing large encampment. This third site will specifically serve people who are homeless near Lake Merritt. Each outdoor shelter site houses 40 people at one time in 20 insulated cabins with windows. The sites include 24/7 security, basic sanitary services, storage for personal items, food service and electricity in each cabin. The first two shelter sites have served more than 125 people and have been an effective and compassionate intervention focused on increasing people’s health, stability, dignity and safety while service providers intensively work with people to help end their unsheltered status. The third community cabin site will house up to 40 people near Lake Merritt. 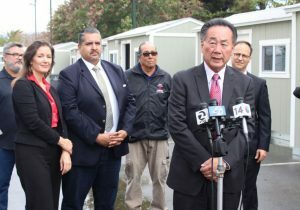 The City of Oakland would like to add five more sites and help up to 400 people move off the streets and into supportive transitional or permanent housing within a year.